A super boy fighting against ASD & T21: Francis, my Little "da Vinci"
Francis, my Little "da Vinci"
It is too early to know if Francis will follow my footprints as a Graphic Designer, but he definitely is creative with a great imagination, this is why I call him, my little 'daVinci.' Since the beginning of this year when he was about 19 months, he began to scribble shapes. The first shape he scribbled/drew was a diamond, and as soon as he finished it; he called me while pointing at the diamond: 'Mom, a kite' — I think that he randomly drew the diamond while scribbling. Several months have passed since then, and he has gained more control over his scribbles, so he has lately been scribbling/drawing 'whales and sharks.' One time while scribbling on the easel, he said: I't's a shark swimming in the castle.' It was a very long sentence with a great imagination. He has recently discovered how to trace letters. I don't have anything do with this. I just gave him the crayons, so I could focus on a project I was doing from work this past Monday, September 23. 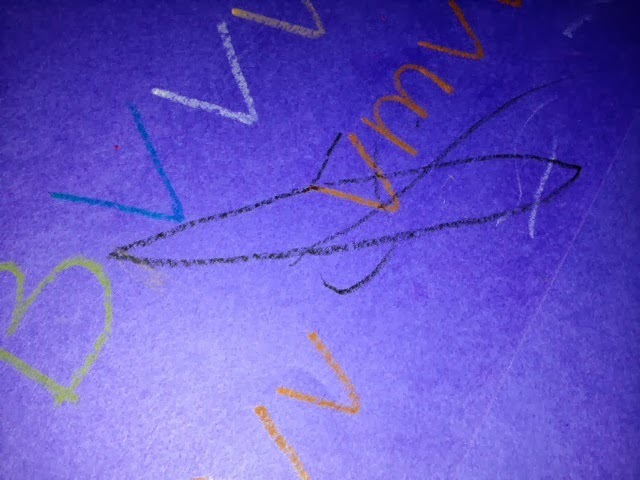 A few minutes passed, so he came back to show me that he wrote the uppercase letter 'V', lowercase 'u' and the lowercase 'l.' He has mastered to trace the uppercase letter 'V' and the lowercase 'l,' but I am not sure about the lower case 'u.' Now he asks us to 'write' letters, so he can watch us tracing them. My boys are discovering the importance and the enjoyment of writing, which it is very interesting to me because it is happening around the same time, even when they have not worked together on tracing. Tommy has worked on tracing at school or the therapy center where Francis and I are not around. Because they both are intersted on 'tracing' I will definitely be looking for tracing educational tools that suit their deferent learning styles/needs and I can work with both kids at the same time. I know kids should be kids and Francis just turned 2, but I cannot stop him. It is better that I follow his lead! I am thinking on Hand Writing Without Tears, but it is quite expensive and I am not sure if Francis will like it. If you have any suggesting please email me or comment in this post. Tommy 'The Super Boy' Keeps rocking!